Hyundai, as name sponsor of the Hyundai Pre-Kick Show for the 2010 Super Bowl, is running two 30 second TV ads during the game, two five second billboards, and three pre-game ads. The Super Bowl campaign is focusing on the Hyundai 2011 Sonata, with one of the commercials featuring an appearance from Vikings NFL player Brett Stavre of the future. In addition to highlighting the all-new Sonata, pre- and post-game spots will showcase the all-new Tucson and revamped Hyundai Assurance consumer protection program. Hyundai’s Super Bowl advertising extends its “Big Voices in Big Places” strategy, which includes high-profile advertising in sporting events, entertainment awards shows and outdoor video board placement. The strategy will continue next month as Hyundai is the exclusive automotive sponsor of the Academy Awards with eight spots planned for the March 7 broadcast. Jeff Bridges, now in his third year working with Hyundai advertising, will continue to serve as the narrator for the upcoming campaign. The Super Bowl campaign was developed at Innocean Worldwide Americas, Irvine, California. 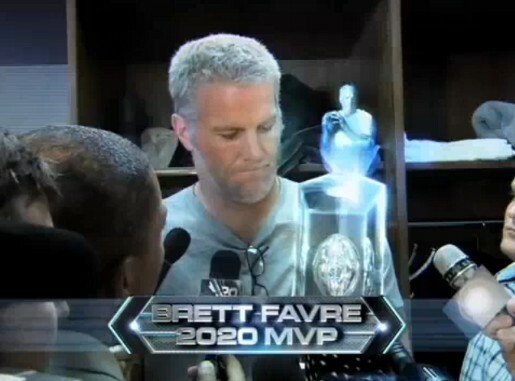 The Brett Favre spots were filmed by director Tim Godsall via Biscuit Filmworks and edited by Paul Sabater at Spot Welders. Bodypass, Paint and Sonata were filmed by director Tim Godsall via Biscuit Filmworks and edited by Brad Waskewich at Spot Welders. Filming for Luxury was shot by director Noam Murro via Biscuit Filmworks and edited by Haines Hall via Spotwelders. Visual effects were produced at Public Visual Effects. Music was produced at Beacon Street.